POST-CRUISE OPTION - Barcelona with Golf at El Prat & PGA Catalunya! 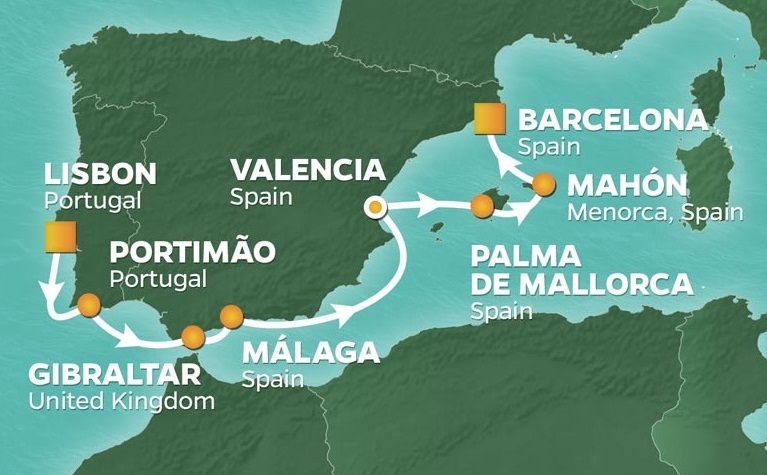 PerryGolf is proud to again partner with Azamara Club Cruises for an exceptional golf voyage onboard the outstanding 690 guest Azamara Journey around the Iberian Peninsula. Our itinerary begins in Lisbon, Portugal and concludes in Barcelona, Spain. The five round line-up begins with The Faldo Course at Amendoeira, situated in Portugal’s famed Algarve region; La Reserva, the most prestigious recent addition to the Sotogrande area with stunning vistas; Finca Cortesin, located to the west of beautiful ... Read More. Marbella; The classic El Saler on the outskirts of Valencia; and finally Son Gual, on the glorious island of Mallorca. On arrival in vibrant Barcelona we also offer a three night post cruise package including play at the highly acclaimed El Prat and PGA Catalunya. Our guest list typically brings together like-minded individuals sharing a love of golf. Inevitably many new friendships are formed. Many guests are golfing couples but an equal number are golfers travelling with a non-golfing spouse. The latter are also exceptionally well catered for as, in addition to the fabulous onboard facilities, a wide selection of Azamara Shore Excursions® are offered in each port. The itinerary also allows for some relaxing “time at sea” under Mediterranean skies. On board, our guests are absolutely spoiled. Our favored ship Azamara Journey is small enough to provide a most intimate experience and nimble enough to access smaller ports, but large enough to provide a great choice of outstanding dining and bars; the ship also offers an exceptional full service spa, and features excellent and varied evening entertainment. In addition to all “normal” cruise features, Azamara Club Cruises include all soft drinks, specialty coffees, boutique daily wines, and a choice of select standard beers and cocktails within the cruise fare, plus all gratuities to create a thoroughly all inclusive cruise experience. Our itinerary is also set to allow for late evenings and occasional overnights in certain ports, allowing you much greater “immersion” in the destination. Forty-four suites are available on Journey, each attended by English-style butler service. If you are inclined to indulge, we recommend you make your arrangements without delay. Portimão is located in the District of Faro in the Algarve Region of Portugal, and is the host venue for many prestigious sailing events. The Lisbon to Dakar Rally passes through, and there is also surfing and kitesurfing. This is a great place for seafood restaurants with grilled sardines being the specialty. Enjoy it on your own arrangements or via Azamara Shore Excursions®. “The Rock” of Gibraltar is a sight to behold rising nearly 1,400 feet out of nowhere located in a strategic position at the southern end of the Iberian Peninsula. It overlooks the Straits of Gibraltar and is linked to Spain by a narrow isthmus. Most of the upper Rock, starting just above the town, is a nature reserve with spectacular views accessible by cable car. Gibraltar is imposing but small. It measures less than six square kilometres and is inhabited by around 30,000 people made up of Gibraltarians, British, Moroccans, Indians and Spanish. There is a colony of the famous, camera-hogging Barbary apes who run free in a semi-wild state. Gibraltar is a British self-governing colony and a member of the European Union by virtue of Britain's membership. Malaga is found on Spain’s famous Costa del Sol along with its coastal and inland neighbors Rincon de la Victoria, Torremolinos, Benalmadena, Fuengirola, Alhaurin de la Torre, Mijas and Marbella. The important cultural infrastructure and the rich artistic heritage have culminated in the nomination of Malaga as a candidate for the 2016 European Capital of Culture. The internationally acclaimed painter and sculptor Pablo Picasso and actor Antonio Banderas were both born in Malaga. Enjoy it on your own or or via Azamara Shore Excursions®. Enjoy a full day in beautiful Valencia. GOLF: El Saler Golf Club is located on the outskirts of Valencia within the Albufera Nature Park. Designed by Javier Arana, one of the most prestigious Spanish designers and opened in 1968, it sits nearby the beach occupying terrain dotted with pine trees and sand dunes and has a distinctly “links” feel. It’s famous "cats claw" (not dissimilar to the Monterey Peninsula’s “iceplant”) is certainly to be avoided in the rough. After disembarking Azamara Journey enjoy three nights in beautiful Barcelona, with golf at the highly rated El Prat and PGA Catalunya. The Faldo Course at Amendoeira designed by Sir Nick Faldo, opened for play in 2008. In a modern twist of a traditional recipe, cacti and wild herbs replace the role of Sunningdale’s heather, and spartan holm oaks and ancient olive trees take the place of a lush English woodland, and desert scrub bunkers of crushed limestone replace Berkshire’s sandy tracts in a golf course that revels in the classic principles of strategic play. It also enjoys great views, in particular on the back nine. Finca Cortesin is ranked as one of Spain’s finest golf courses by Golf Digest Magazine. Cabell B. Robinson’s design beautifully complements the natural landscape. It provides a perfect balance between 20 varieties of flora, the typical Mediterranean forest and the perfectly manicured bermuda grasses of the golf course. Finca Cortesin played host to the prestigious Volvo World Match Play Championship for 3 years, with many of the world’s finest professional competing. El Saler Golf Club is located on the outskirts of Valencia within the Albufera Nature Park. Designed by Javier Arana, one of the most prestigious Spanish designers and opened in 1968, it sits nearby the beach occupying terrain dotted with pine trees and sand dunes and has a distinctly 'links' feel. It’s famous 'cats claw' (not dissimilar to the Monterey Penisula’s 'iceplant') is certainly to be avoided in the rough.